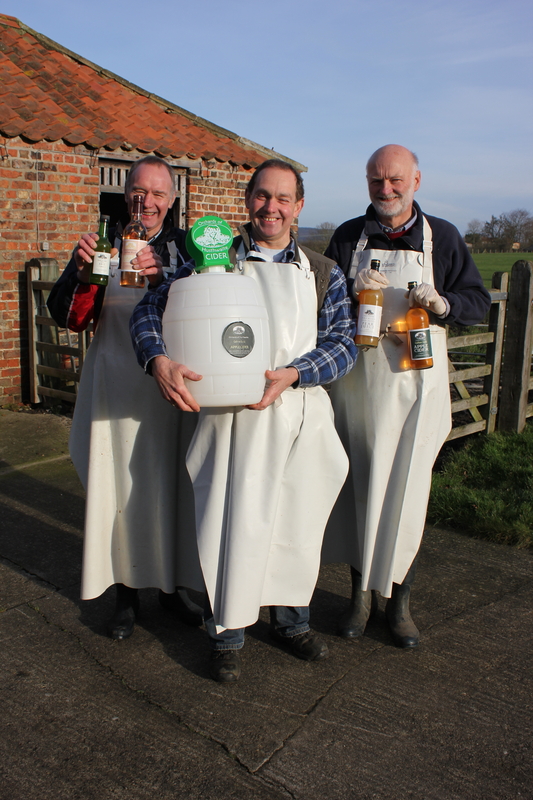 How the residents of a Yorkshire village used cider to return to their roots. We’re all aware of Yorkshire’s long and proud brewing tradition and, as well as being the world’s greatest brewer of ales, the county has even begun cultivating an unexpected reputation as a wine producer. Yorkshire cider-makers, though, are ordinarily very few and far between. 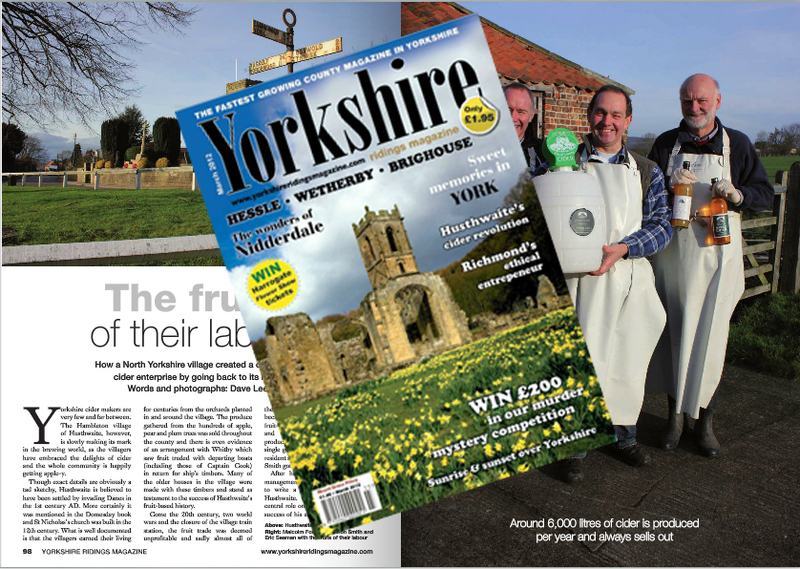 The Hambleton village of Husthwaite, however, is slowly making its mark in the brewing world, as the villagers have embraced the delights of cider and the whole community is happily getting apple-y. 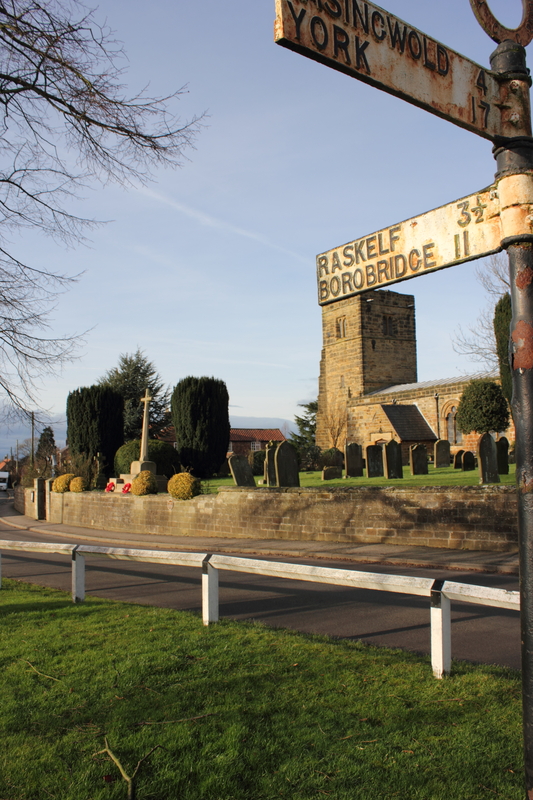 Though exact details are obviously a tad sketchy, Husthwaite is believed to have been settled by invading Danes sometime in the 1st century AD. More certainly, it’s known to be mentioned in the Domesday book and the existing church (St Nicholas’s) was built in the 12th century. What is very well documented is that the villagers earned their living for many hundreds of years from the orchards planted in and around the village. The produce gathered from the hundreds of apple, pear and plum trees were sold throughout the county and there is even evidence of an arrangement with Whitby which saw fruit traded with departing boats (including those of Captain Cook) in return for ship’s timbers. Many of the older houses in the village were made with these timbers and stand as testament to the success of Husthwaite’s fruit-based history. Come the 20th century, two world wars and the closure of the village train station, the fruit trade was deemed unprofitable and sadly almost all of the trees were grubbed up and destroyed. Husthwaite became just another pretty, quiet, fruit-less North Yorkshire village and hundreds of years of proud, productive history was forsaken in a single generation. Until, that is, village resident and amateur historian Cameron Smith got a bee in his bonnet. After his retirement from a retail management job, Cameron decided to research and write a book on the history of Husthwaite. Once he discovered the central role orchards had played in the success of his adopted home village he hatched a scheme to bring them back. So far, thanks to some hard-won grant money and the involvement of the whole village, over 500 apple trees have been planted in the gardens of the houses of Husthwaite. Furthermore, the fruit of the trees is pressed, brewed, bottled and sold, with the revenue from sales being re-invested in the local community. A very Yorkshire cider revolution is underway in Husthwaite and it warms the cockles (as well as wets the whistle) to see it happening. 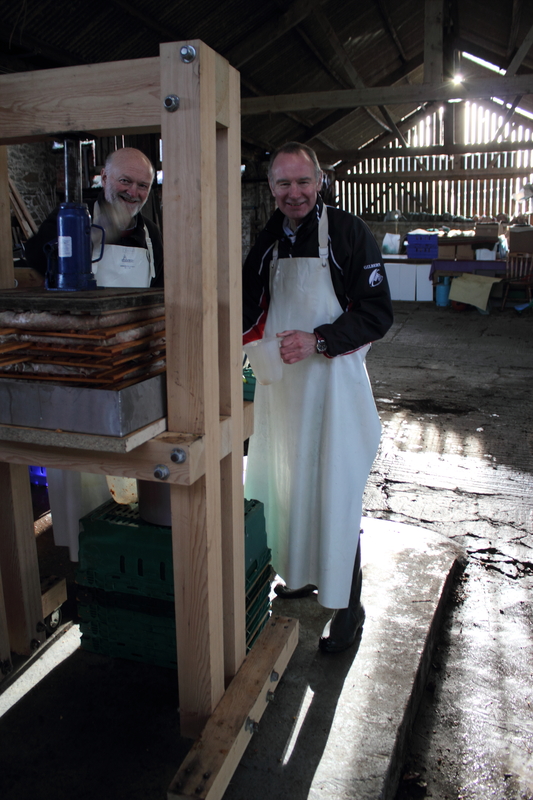 During most months of the year, in a barn behind a farmhouse in the middle of the village, you will find a small but dedicated group of volunteers manning the presses required to make ‘Orchards of Husthwaite’ ciders and apple juices. On the day I visit I meet Cameron himself along with former dentist Eric Seaman and retired policeman Malcolm Foster. They are all merrily labouring away on the presses, turning the last of the year’s apple harvest into juice and then into cider. The process is fairly simple. Apples are first crushed in a kind of wood-chipper device, the resulting mulch is spread evenly across cloths which are then stacked between wooden slats. These apple-filled cloths are known as ‘cheeses’ and when downward pressure is applied to them (courtesy of a common-or-garden hand-cranked car jack) juice begins to flow, first into a drip tray and then through a sieve into a barrel. We all enjoy a taste of the resulting juice, which is deliciously sweet and tangily fresh, before it is placed into the store. Yeast and a couple of other natural supplements will be added to the barrel in the coming weeks to begin the brewing process and balance the taste. Ironically, this will be the last time Malcolm will taste the fruits (so to speak) of his labour as he doesn’t like cider! ‘I’m an ale man, me’, he defiantly declares as he removes the just-pressed cheeses from the press. Once the cider is ready, its bottled – there are two varieties ‘Gold’ and ‘Blush’ – and sold to local pubs and restaurants or at county fairs. The project produces around 6,000 litres per year and always sells out. There are no plans to increase production, however, despite there now being a surfeit of fruit come the Autumn. ‘We’ve loads of apples and pears going unused and unpicked’ Cameron explains, ‘but increasing production would mean employing full-time staff and that would put too much expectation and pressure on the project’. It’s an admirably cautious stance for such a successful and widely-embraced project to take but the villagers are keen that their cider-making be a small, personal concern rather than a potentially over-demanding millstone. After all, most of Husthwaite’s residents moved here to enjoy the slow pace of life, not to become brewing magnates. After the cider-making lesson, Cameron takes me up to the village hall to see exactly how the orchards project is benefiting the local community. No firm decision has yet been made about how the profits will be utilised in the long term but today one of the first events sponsored by Husthwaite’s farmhouse industry is well in swing. 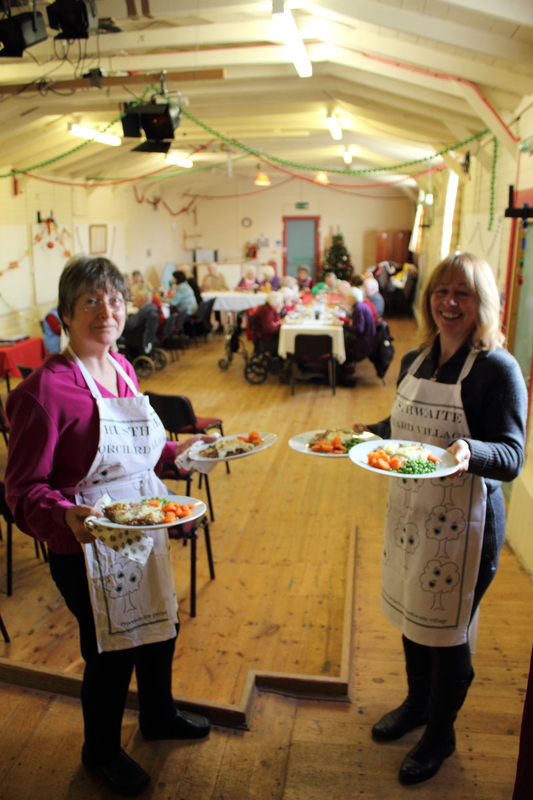 In the village hall is a group of 30 or so elderly residents of surrounding villages; they are enjoying a hot meal cooked by more volunteers and then there will be an afternoon or singing, dancing and entertainment. All of this is paid for by cider money and is typical of the type of endeavours the trustees of the orchards project would like to see their efforts fund. Orchards of Husthwaite really is a heart-warming project and one which has united, excited and involved the whole of the community. Even the local pub has changed its name to honour the reawakening of Husthwaite’s original raison d’être – they’ve called it the Orchard Inn, and guess what takes pride of place behind the bar? A barrel of cider – created a few feet up the road, from apples grown in the gardens of the locals, it tastes as good as any cider brewed in the West Country, but somehow seems all the sweeter for knowing how communally it was created. So, fill your glass and let’s raise a toast to the orchards and people of the village of Husthwaite. Three cheers for them and their dedication to securing their future by honouring the past.